The Exit Light Company offers a complete selection of smoke detectors / alarms designed to meet the specific requirements of areas of the home and types of fires. Properly installed and maintained, residential smoke alarms are one of the best and least expensive ways to provide an early warning when a fire begins. Smoke alarms save lives, prevent injuries and minimize property damage by alerting residents early to a fire hazard. Both residential and commercial customers will find a variety of units for their applications. All customers would benefit from the KD-RF-SM-DC. These units can be quickly installed to an interconnected smoke alarm system without the mess of rewiring or cost of labor. This battery-powered, UL Listed alarm links with other alarms and components to create a customized, advanced fire protection system. It even can be placed in a detached workshop or shed and linked into the system. Interconnected alarms provide early warning against fire by adding additional coverage throughout your home, dramatically increasing your ability to hear an alarm anywhere, regardless of where the fire starts. When one alarm sounds they all do! 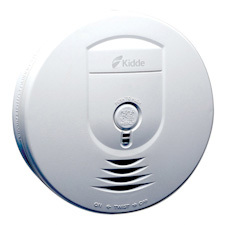 Newer homes are required by code to have interconnected alarms. Wireless technology enables any home to have an interconnected system, keeping its occupants safe.